Because it’s nearly Easter and because these were so good, I’ve decided to repost this recipe from last year. I’m of the opinion that Hot Cross Buns should only eaten to be at Easter time despite the supermarket sales campaigns that generally begins soon after Christmas. For the last 4 years I have tweaked and refined my original 100% Spelt Sourdough Hot Cross Buns recipe just for the enjoyment of my family. I seek to make buns that are dense and moist, buns that have a delicious balance of warm spicy sweetness, buns that are studded with soft vine fruits, buns that so delicious that you find it hard to say no to more than one. My sourdough Hot Cross Buns also need to be gut friendly so a long slow fermentation is necessary and in this case it was 20 hours. These buns are lactose free, cane sugar free and the amount of currants used is deliberately controlled to make them low Fodmap. For me Easter is not complete without buns for breakfast and I’m not missing out. This dough recipe makes 30 Hot Cross Buns, but the recipe can be easily halved without compromise. Begin by activating your sourdough starter. You want to mix the dough when the starter is at it’s peak. Pour the hot chai over the currants and set aside to cool. Gently heat the milk to remove the fridge chill. Into a large non reactive bowl measures the starter, flour, salt, spices and nuts. Drain the currants and set aside the tea. Measure the rice malt syrup and coconut oil in a large measuring jug. Add the eggs and tea, then enough milk to make the volume 650 mis. Put the currants into the bowl with the flour then pour over the liquids. Mix to a shaggy dough then cover and set the dough aside for 20 minutes. Dust the bench with a little spelt flour, tip the dough onto the bench and knead it only until smooth and elastic. Wash the bowl and lightly oil the inside with a smear of coconut oil. Return the dough to the bowl, turn the dough over so it’s coated in oil then cover and set aside for 30 minutes. With wet hands, grasp the dough and stretch it upward, fold it over on itself. Turn the bowl a quarter turn and repeat the stretch and fold. Repeat twice more. Cover again. Every 30 minutes for 2 hours repeat the stretch and fold routine. Allow the dough to bench rest in a covered bowl for another 1 hour or until the poke test indicates that fermentation is slowing down. Refrigerate the covered dough overnight. The next day, about two hours before you intend to bake, remove the dough from the fridge and gently tip it onto the bench. Divide the dough into 30 X 80g pieces. Line a flat oven tray with baking paper. Shape each piece of dough into a ball by folding it in on itself until the outside surface shows no exposed fruit and the surface tension has developed. Place the shaped buns on the baking tray so they are only just touching. Cover the buns with a damp tea towel and allow to rest in a warm place for 1 -1 1/2 hours or until slightly risen. Crosses: Make a thick slurry with 4 heaped tablespoons of gluten free flour, pinch of baking powder and 4 tablespoons water. Pipe the crosses onto the buns then put them immediately into the hot oven and bake for 10 minutes at 220C. Reduce the heat to 200C and bake for a further 15 – 20 minutes. They should be golden brown and firm to the touch. Glaze: In a small pan heat 1/4 cup sugar and 1/4 cup water until the sugar has melted. Increase the heat and simmer the syrup for 1 minute. When the baking time is complete remove the buns from the oven and brush the tops generously with the glaze. Return the buns to the oven for 3 minutes to set the glaze. Set the buns aside to cool on wire rack. Your Hot Cross Buns look wonderfully tasty. I love working with spelt flour and the current addition sounds great. I’m seeing these on our Easter dinner menu. Thanks for sharing. Liked it the first time and, no doubt, will like this tweak as well. Might try another form of tea rather than chai. I also firmly believe they are a holiday treat to be made around Easter and not just after Christmas or at any other time of year. It takes the specialness out of them and makes them ordinary. Chai in bread? How brilliant is that?!!!! Love this recipe, and they look beautiful. 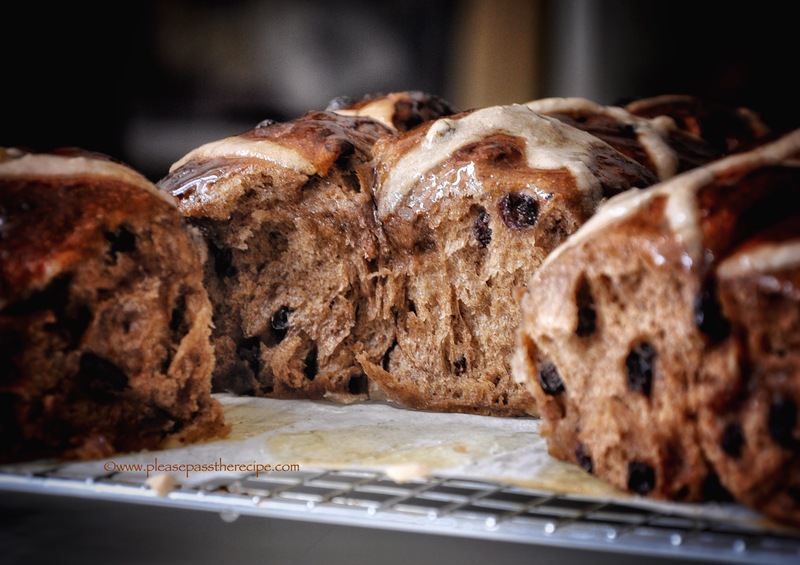 This entry was posted on March 28, 2019 by ladyredspecs in Baking, bread, Breakfast and Brunch, Cooking, FODMAP diet, Food, recipes, sourdough bread and tagged 100%spelt sourdough hot cross buns, Baking, Easter, easter buns, FODMAP diet, hot cross buns, sourdough, sourdough baking, sourdough hot cross buns.